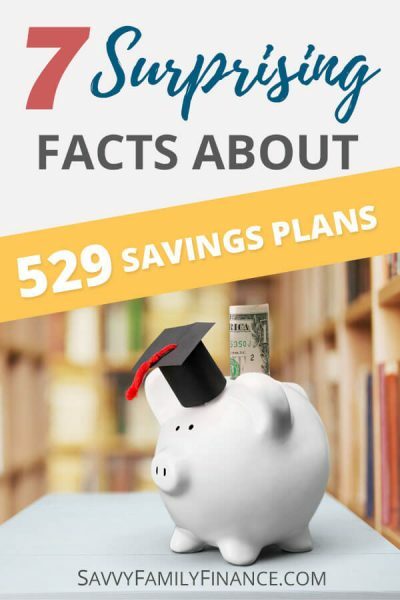 Inside: If you know that a 529 plan is a college savings account, you already know more than many people. Here, you’ll learn 7 surprising facts about 529 savings plans that people often aren’t aware of. A 529 college savings plan is a great way to save for your child’s college expenses. Unfortunately, there are many misconceptions about these plans. The 529 funds aren’t restricted to 4-year colleges, or to the U.S.
You may not know it, but 30 states plus the District of Columbia offer some sort of state tax deduction for contributions to a state 529 plan. There are even seven states that offer tax deductions for contributions to any state 529 plan. Those seven states are Arizona, Arkansas, Kansas, Minnesota, Missouri, Montana, and Pennsylvania. Of course, some states don’t have an income tax and there are currently seven states that do have an income tax but don’t allow tax deductions for contributions: California, Delaware, Hawaii, Kentucky, Maine, New Jersey, and North Carolina. Tax deductions aside, you can open a 529 plan in any state. So, if you live in Oregon, you can have an account with the state plan for the tax deduction and/or have a 529 account in Nevada because you like the plan there. Your child doesn’t need to go to college in either of Oregon or Nevada to use the funds. The account can be held in any state. Depending on where you live and how the account is managed, it may make sense to have an in-state 529 account to take advantage of tax benefits. Otherwise, it is worth shopping around. Related: Money Basics: What is a 529 Plan? You may argue that your child is brilliant or an athletic wonder and will surely get a full-ride scholarship. Well, I’m here to tell you that may not happen. But, what happens to the 529 if your child does get a scholarship? If she does manage to snag hefty scholarships, the 10% penalty on non-qualified withdrawals is waived for the scholarship amount. This means if your child gets a $20,000 scholarship, you can withdraw that amount penalty-free. You will, however, still owe income taxes on the earnings portion of the withdrawal (not on the portion you contributed). You can use 529 savings at many types of post-secondary schools besides the traditional 4-year university. The main requirement is that the school is an accredited school on the IRS list of eligible schools. This list includes trade schools, culinary schools, community colleges and even online schools. Your child can even attend schools abroad. There are eligible institutions around the globe from Canada, Ireland, Israel, South Africa, Wales, and many more. Have money left over? The savings can also be used towards graduate school, medical or law school as well. What if your child doesn’t go to college or there is money left over? There are a few ways to handle that situation. One is that you can change the beneficiary on the account to another person. Maybe you want to go back to school, or another qualified family member could use the money. This is probably the easiest change to make and it won’t incur any penalties. Another way to handle it is to go ahead and take a non-qualified distribution (take out the money). Yes, there is a 10% penalty along with taxes and you may need to pay back any state tax breaks. BUT, that penalty and taxes are only on the amount your money has earned. In other words, you won’t pay a penalty or taxes on the funds you contributed, just the funds that grew from that. Did you know that you aren’t locked into whatever investment you initially select in a 529 plan? While you aren’t able to change investments monthly, you are allowed to change your investments twice per calendar year. This is handy if you do more research and decide another option is better or, sometimes plans will change investments offered and that is often a great time to re-evaluate your choices. It is true that money withdrawn from a 529 plan is to be used for qualified expenses. Tuition is an obvious qualified expense. Beyond that, expenses that also qualify include required fees, required books, and supplies including a computer used for school. You may be able to use funds for room and board IF the student is more than half time and the expenses are paid directly to the university. As usual, keep all receipts and records, because stuff happens. There are a lot of great things about saving for college using a 529 plan. If you are still on the fence or have more “what ifs,” talk to your tax advisor or financial planner. Have you been surprised by any features of 529 plans?